Despite its small size, your Android phone is an incredibly complicated and powerful piece of gear. It can get you online, take photos, make phone calls—it can even pay for your groceries. There’s a lot going on, which means a lot to learn, even if you’re otherwise savvy about technology. We’re here to help. Knowing these terms will help you get a better grasp on the tech that powers your phone. Bookmark this page for future reference, and if you have any other terms you think we should include, feel free to leave a comment below. ADB, otherwise known as Android Debug Bridge, is a developer tool that lets you send commands to an Android device you’ve connected to your computer. It’s a fairly advanced tool, and you run it through the command line on your PC or Mac, but if you ever want to install, say, a developer preview release of Android on your phone, you’ll need to delve into ADB. Android Studio is your one-stop shop for building Android apps. Android Studio is Google’s software development kit (a collection of programing apps and tools, abbreviated SDK) that developers use to build apps for Android devices. Android Studio includes a code editor, various code templates you can use as the basis of your app, device simulators for testing your apps, and numerous other development tools. Want to learn more about building apps for Android? Hop on over to Google’s Android Developers site. API: Short for Application Programming Interface. APIs are functions that developers can call on to access specific features by calling upon programs, code, and services that others have written. For example, if a developer wants to draw a button on the screen, she can insert a small bit of code that says “draw this kind of button, with this color and size and style, at this location” instead of dozens of lines of code that tells the graphics processor, in detail, exactly how to draw a button. If the application wants your location, it can use the location API to “get the device’s location” and let Google’s code handle the rest, instead of requiring the developer to build an entire location service from scratch just for her own app. There are thousands of APIs in Android, covering everything from drawing interface elements, to the cameras, to location access, to accessing storage, to 3D graphics (see: OpenGL ES) and much more. ARM usually refers to the processor architecture that is most commonly found in mobile devices like smartphones and tablets. While ARM-based processors can vary widely—you’ll find them in both the smallest mobile devices as well as high-end servers—the variants used inside smartphones and tablets are designed to be smaller and to consume less energy than the processors you’ll typically find in your PC. That doesn’t mean ARM processors are weak, though—the processors found inside mobile devices have grown significantly more powerful in recent years, and that trend shows no sign of slowing. The ARM architecture standard is maintained by the company ARM, which licenses their own designs for processors, processor cores, and processor architectures to other manufacturers. Samsung and Qualcomm are two major manufacturers of ARM-based processors; Apple uses its own ARM-based A-series processors in the iPhone and iPad, too. Baseband: Your phone’s baseband is, in short, the part of the phone that handles its radio connections (cellular and Wi-Fi, for example). The phone’s baseband consists of a processing chip and code that work their magic behind the scenes. You normally won’t have to touch your phone’s baseband system software, but if you need to know which baseband version your phone is running, go to Settings > About phone. Fastboot mode lets you access your phone’s bootloader. Bootloader: Before your phone’s operating system even starts up, your phone runs a piece of software called a bootloader. Bootloaders generally run some initial startup tests and related tasks, then tell your operating system to start up. It’s very similar to the BIOS on your PC in this regard. The bootloader does its work in the background, so you never see it unless you specifically choose to do so. If you know what you’re doing, though, you can access the bootloader interface on your Android phone using the aforementioned Android Developer Bridge (ADB) tool. Dalvik and ART (short for Android Runtime) are, simply put, what allows apps to run on Android. They are what’s known as “managed runtime environments”: Think of them as the “box” within which all apps for Android run. By running apps within a “box,” developers don’t have to worry as much about the device you’re running the app on; Dalvink and ART also handle some under-the-hood tasks on behalf of the apps. Android apps are based primarily on Java, and ART (and Dalvik before that) are the parts of Android that compile the Java code to run on your device. The newer ART component is faster and takes better advantage of modern processor features than the older Dalvik component. Android Marshmallow’s Doze mode can seriously save your battery, but you can turn it off for individual apps if you need to. Doze: New in Android 6.0 Marshmallow, Doze is a power-saving feature that prevents your phone from carrying out certain tasks if your phone’s been sitting idle for a while. It puts your phone into a deep sleep mode and only wakes it up sporadically to handle background tasks, which saves a lot of battery power. It’s on by default, but you can easily turn it off for individual apps. Is fragmentation that big of an issue? That’s certainly debatable. But it’s probably less of a concern for “normal” users than it is for more technical folk. The wide variety of hardware and software in the Android world can be a pain for developers, whose apps have to be tested on a wide variety of devices to ensure they work right. For the rest of us, the slow rollout of new Android updates is one thing to be concerned about, if only for the security improvements that often accompany them. HDR stands for High Dynamic Range, and it refers to a photography technique in which several photos taken at different exposures which are then combined into a single image. By snapping photos at different exposures, you can get proper exposure and detail in both the dark and bright areas of the photo. Some modern phones can take HDR photos in a single snap by carefully processing the data from an advanced sensor with a wide dynamic range. IPS, short for In-Plane Switching, is a display technology used in LCD screens. IPS displays have a wider viewing angle compared to twisted nematic (TN) displays—the other prevalent LCD technology—largely eliminating the color-shifting issues that have traditionally affected LCDs. They also have a wider color gamut, and can accurately reproduce more colors. Among Android devices, the other popular display technology is OLED. Google’s Play Music app adheres to Material Design standards. Note the use of vibrant colors, drop shadows, and consistent, standardized controls. Material Design: In Android Lollipop, Google introduced a fresh new look and feel for Android, which the company called Material Design. Material Design puts an emphasis on depth, bold graphical elements, and fluid motion to help you get a sense of place. Google currently employs the Material Design look and feel across Android, its various other mobile apps, and some of its online tools such as Google Maps and the redesigned Google+ social network. Material Design isn’t just a set of interface elements from Google. It’s a clearly codified set of interface conventions that describe all aspects of how an application interface should look and behave. Fonts, colors, animations, shadows, layers, patterns, the placement of interface elements; all this and more are described in detail in the Material Design guidelines set by Google. The idea is that third-party app developers should make Android apps that have a consistent look, and operate with the same interface conventions, so they all appear to be part of a cohesive ecosystem. That way users don’t get confused by changing interfaces. Milliampre-hour—abbreviated mAh—is a unit for measuring electrical charge. It’s often used to describe the capacity of a battery, and you’ll often find it in marketing materials for smartphones and tablets. The higher the mAh rating for a battery, the larger its capacity. However, since the tech specs and power management systems can vary wildly from one device and another, a battery’s charge capacity isn’t the only factor that determines battery life. A phone with a smaller mAh rating on its battery might last longer if the display and processor and radios are more energy-efficient, for instance. Miracast is an industry standard technology that lets you stream what’s on your phone to or tablet onto your TV or other display. Miracast-compatible devices work together on a peer-to-peer basis—you don’t need a router to act as a middleman between your phone and TV. In order to use Miracast, you need to be running an OS that supports it, and you need a Miracast-compatible TV or receiver dongle. Check out PCWorld’s Miracast setup tutorial to learn more. Nearby: As its name suggests, Nearby lets you connect to and share data with other devices that are, well, nearby. According to Google, Nearby “uses a combination of Bluetooth, Wi-Fi, and inaudible sound” to identify other nearby devices. Nearby isn’t a standalone feature in Android; instead, it’s a set of technologies that developers can incorporate into their apps. For example, Google Play Games uses Nearby to find others near you who you can play a game with—a handy feature if you want to play with a family member or roommate without going through a network or server. 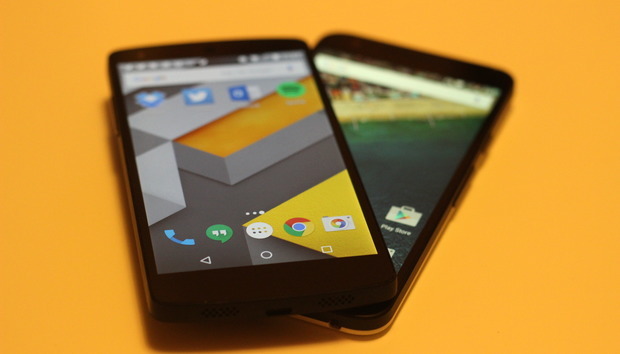 A Nexus 5 and Nexus 5x. Nexus: This is Google’s brand name for a line of phones and tablets that run pure, unadulterated “stock” Android, sold direct to consumers by Google, and with Google providing software updates with no carrier interference. Nexus devices don’t come bundled with carrier-specific apps, nor do they include the customized interfaces and branded features that so many Android phones ship with. As an added bonus, Nexus devices get new releases of Android first, often weeks or months before other phones. It’s important to note that Google doesn’t actually manufacture Nexus devices: Instead, it partners with other hardware manufactures, like Samsung, LG, and Huawei, which design and build a phone or tablet that meets Google’s specifications. Nexus phones started as a necessity—Google says it can’t really develop Android as a competitive operating system without simultaneously developing phone hardware to test the latest features before release. And developers need a “baseline” phone that runs unaltered Android to test their applications on. Today, Nexus devices appeal to the mass market, with prominent TV ads and such. NFC, which stands for Near Field Communication, is a technology that lets you wirelessly beam information between devices. Unlike Bluetooth and Wi-Fi—which have ranges that can span multiple rooms in your house—NFC has a range of only a few inches. It’s built into many smartphones, and it’s most commonly used to facilitate mobile payment systems like Google Pay and Apple Pay: Hold hold your phone up to an NFC-equipped credit card terminal, wait for the reader to recognize your phone and retrieve your payment info, and you’re all done. On Android phones, NFC can also be used to facilitate the transfer of data from one phone to another by “bumping” them together. OLED and AMOLED: OLED, which stands for Organic Light-Emitting Diode, refers to a specific kind of display technology. Unlike LCDs, OLEDs emit their own light, so they don’t require a backlight. AMOLED (Active Matrix Organic Light-Emitting Diode) is a variant of OLED technology commonly used in smartphones. HowStuffWorks has an in-depth overview of how OLED screens work and the differences between the different kinds of OLED screens. OLED displays can have excellent color reproduction and very fast switching speeds (the ability of pixels to turn on and off). And since the pixels emit their own light, when they’re off, they’re completely black. Only recently have OLED displays been able to get as bright as LCDs, however, and they tend to be more expensive. OpenGL ES: OpenGL is a set of programming APIs and technologies that developers can use as the basis of apps that employ 3D rendering. Many games are built atop OpenGL, as are many 3D modeling and design apps. OpenGL ES is a pared-down version of OpenGL built for devices like smartphones and tablets (the ES stands for “embedded systems”). The 3D games you play on your Android phone are likely built atop OpenGL ES. The Overflow menu as seen in the YouTube app. Overflow button: You know the three dots that appear in the upper right-hand corner of the screen in many Android apps? It has a name—the Overflow button. Tap it, and you’ll be able to get at additional options, tools, or settings that don’t have a home in an app’s toolbar. Overlay: An overlay is a customized interface that smartphone manufacturers develop for their phones and place atop Android. Most custom overlays look, feel, and work similarly to unmodified “stock” Android, but are modified somewhat to suit manufacturers’ and carriers’ needs. Some overlays also come bundled with device-specific apps. For example, Samsung’s Galaxy devices run a customized version of Android that features Samsung’s TouchWiz interface and apps like Samsung Pay. Qi and PMA are two competing standards for wireless charging. The Wireless Power Consortium—which includes LG, HTC, and Verizon—backs Qi, while the PMA standard gets its backing from the AirFuel Alliance, a group that includes AT&T, Broadcom, Intel, Powermat, Duracell, and Starbucks. Some companies, like Samsung and Qualcomm, are involved in both groups. Quick Charge: Typically, fully recharging a phone can take a few hours. Quick Charge, however, can help speed things up: It’s Qualcomm’s name for its fast-charging technology, and the company claims that it can increase your phone’s battery-charging speed by as much as 75 percent. To take advantage of Quick Charge, you need a device that supports it, as well as a Quick Charge wall adapter. Curious if your phone or tablet supports Quick Charge? Take a look at Qualcomm’s compatibility list (PDF). Other phone makers have built their own fast-charging capabilities into their phones—the Nexus 6P and 5X use USB Type-C’s power delivery standard to charge the phone faster, and Samsung has its own fast-charging technology in the Galaxy S6, to name a couple examples. Rooting: By default, Android has security precautions in place to prevent you—or an unauthorized party—from messing up your phone too badly. When you “root” your phone, you bypass these security measures, which in turn allows you to customize it in ways that are otherwise not possible. You can even replace the Android OS that shipped with your phone with something else like Cyanogenmod, one of many alternative versions of Android out there. Rooting is, specifically, gaining “root access” to the operating system, allowing you to change or replace parts of the OS that you’re not meant to be able to tamper with. As for the legality of rooting your phone, it’s allowed in the United States as of this writing through an exemption in the DMCA, according to the Electronic Frontier Foundation. The bad news? That exemption runs only through the end of 2015. Rooting your phone can allow you to do neat things, but it also poses a serious security risk. Smart Lock: It’s a good idea to use a passcode or password to protect your phone, but it can be a pain to enter it every time you take your phone out of your pocket. Android’s Smart Lock feature can detect when you have your phone with you—when it does, it’ll remain unlocked. Smart Lock has lots of features and methods to unlock your phone: like when your phone is connected to a particular bluetooth device (like your car) or is in a specific location (your home or office). Smart Lock is also built into Chrome OS, and it even works with passwords. Stock Android (Also vanilla Android): “Stock Android” is a term often used to describe pure, unadulterated Android—that is, versions of Android that phone vendors and carriers haven’t customized. It’s Google’s interface, features, and apps, and nothing else. Relatively few phones run unmodified versions of Android; if you want a phone running stock Android, your best bet is to go with one of the Nexus phones. Some manufacturers have their own versions of Android that look and feel very much like Stock Android, with precious few modifications only to enable exclusive features. Motorola, OnePlus, and Nvidia are good examples. USB Type C (left) compared to the more common USB Type A (right). USB Type-C: You’re probably familiar with a good many of the USB connectors out there: There’s USB Type A (the port most likely to be on your computer), USB Type B (often found on printers), Mini USB, and Micro USB (commonly found on phones and tablets). USB Type C is a brand new USB connector that’s only a tiny bit larger than Micro USB and more versatile than other kinds of USB ports. For one, USB C connectors are reversible: You don’t need to figure out which way is the right side up as you do with other USB connectors. It also has a higher theoretical data rate, but your devices will need to use the USB 3.1 standard in order to take advantage of it. Perhaps most importantly, it makes possible much higher power transmission; enough to serve as the power cord for lightweight laptops. For now, only a few Android devices, such as the Nexus 5X and Nexus 6P, make use of USB C, but you can expect to see it on more phones and tablets as time goes by. WakeLock: Typically, you aren’t going to want your phone to stay awake indefinitely—you’ll want it to go to sleep after a set amount of time to prevent its battery from running out at an inopportune time. But once in a while, an app will need to keep the phone awake: For example, you probably don’t want your phone’s screen shutting off if you’re in the middle of a video chat, or while following step-by-step directions in your car. An Intel Core i7 is one processor you won’t ever find in an Android phone, but there are smaller x86 chips made by Intel for mobile devices. x86: If you are familiar with PC hardware, you’ve probably seen this term get brandied about. In short, x86 is a name given to the kind of processor architecture popularized by Intel and used by the vast majority of PCs. (More modern 64-bit x86 processors are sometimes called “x64” or “x86-64” chips, but they still fall under the x86 umbrella.) Intel’s Pentium, Celeron, and Core lines—as well as AMD’s processors—are all x86 processors. You won’t find x86 in many Android smartphones or tablets, but those that use Intel’s Atom processors are based on the x86 architecture. « Does remote project management really work?